Who? has two parts: 1) who are BioFables’ main characters? and 2) who are BioFables’ intended readers? Mallory and his twin sister Melody play starring roles in BioFables. They, like their father and grandfather, nearly always refer to themselves by their nicknames. Even Agnes is often called “Aggie” by her father-in-law (although she calls herself “Agnes”). These five characters have begun writing their own blogs, and they’ve all already written their biographies (see Agnes, Mallory, Melody, Mike and Mort). 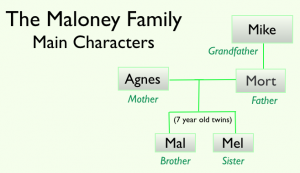 You’ll meet other members of the Maloney extended family in Book 2 and in not-yet-published Book 9. Other helpful characters (I call them mentors — discussed in 6. How?) make cameo appearances in each of the BioFable books. Have you ever re-read (and enjoyed) a book that you loved as a child? Perhaps Alice in Wonderland, 20,000 Leagues Under the Sea, or The Little Prince come to mind. These and other classics share a similar characteristic: their stories appeal to multiple levels of intellectual and emotional perspectives. Their multi-level appeal is ageless (children and adults enjoy different aspects of the books) and classless (each reader’s unique life experiences lead to different perspectives). Books can help instill a life-long habit of reading and love of learning, especially with early pleasant experiences. The title of an Inc. Magazine article says it well: Why Reading Is the Most Intelligent Thing You Can Do (at any age!). The BioFables series aspires to similar lofty goals. I wonder: are we there yet? Here are some examples of how BioFables books “speak” to different kinds of readers depicted in the image above. See the section 2. What? for a discussion on the value of Companion Books and this website for adults and older children. Childhood is a time for daydreaming, exploring, laughing, learning, and discovering who they are and what pursuits spark their curiosity. Isn’t it wonderful when young readers are inspired by a book to learn more about a subject that was part of an entertaining story? Everyone seems to be talking and writing about STEM subjects (Science, Technology, Engineering, Math), and for good reason. See STEM/Literacy Advocates, below. Children, and the adults around them, fit into three general categories: 1) STEM enthusiasts; 2) STEM neutralists; 3) STEM resisters. BioFables appeal and value reaches all three types in different ways. STEM enthusiasts read science books and run experiments with everyday objects. STEM enthusiasts will find plenty to keep themselves engaged while absorbing the broad variety of humanities topics that pop up in each BioFables book. STEM neutralists need to see the value in learning how the world works. STEM topics in BioFables stories focus on the practical, useful aspects of STEM subjects. STEM resisters need a bit more encouragement. STEM resisters can relate to the stars of BioFables, 7-year-old Melody and her twin brother Mallory, as they have fun learning tidbits of STEM and non-STEM subjects. Appealing to STEM enthusiasts, neutralists and resisters is BioFables’ overarching goal. Each book offers a wide spectrum of ideas, subjects, and healthy activities in a variety of outdoor locations (see What). Readers younger than seven will be able to enjoy BioFables stories when parents or other relatives read to them. While they may not understand or remember much of the science or humanities lessons, these girls and boys can relate to the stories and to the stars of the series: twin sister and brother Melody and Mallory. Discussing the stories as they hear them helps bonding with the reader and reinforces learning (see How). Older children can read BioFables books for themselves, read them to younger siblings, or even read them to their parents. Everyone (I hope!) wants their children to be successful. What better way is there to instill a love of reading in your children than to be caught in the act of reading? Reading a book that you want your children to read (perhaps a BioFables book?) is even better. Grandparents play their own special role. Yes, they spoil their grandkids in a way that you might not, but that also increases their influence, such as a recommendation (or gift) of a book. Not a bad trade-off. Same holds true for a favorite aunt or uncle. BioFables books can be paricularly appealing to children just because they aren’t part of a required-reading list. Favorite teachers and mentors, who view BioFables books as a good fit for their protégés, might recommend them for discretionary reading. BioFables Companion Books help dissect each book’s science and humanities topics. STEM jobs are predicted to increase by up to 62% in some industries by 2020. Reading ability is essential for developing thinking and reasoning skills for success in both STEM and non-STEM (humanities/arts/management) areas. Those concerned with improving academic achievement levels will find that each BioFables book offers glimpses into at least 40 different science, humanities and arts subjects. BioFables books delight people of all ages and backgrounds. I invite you to explore this website to see if any of the current BioFables books has special appeal to you. Please feel free to send me an email with your impressions. Read a bird’s eye view of the who, what, where, when, why and how of BioFables here.